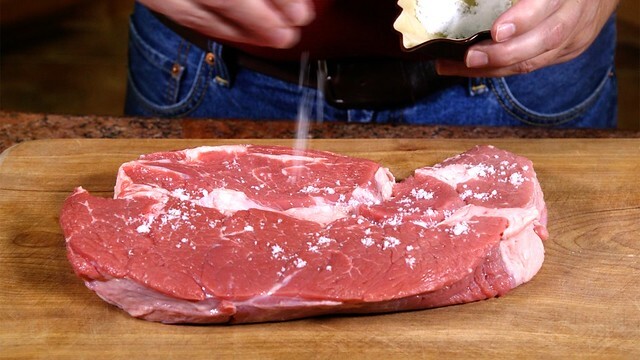 Season steak (chuck roast) with salt and pepper. To a small pot add bag juices (or beef stock), wine and pinch of black pepper. Reduce to 1/3. To a pan add 3 Tablespoons of oil, shallots and mushrooms. Cook until they start to get some color. Make a roux by adding flour to the shallots and mushrooms, reduce flame cook until the flour is slightly browned. Strain the reduced liquid into the roux, adjust consistency of the liquid with water or beef broth. Taste for seasoning. Sear steak on one side and flip. Add 1 Table spoon butter to sauce and shake pan in incorporate. When the steak is seared on both sides remove from the heat. Carve (no need to rest) and serve with sauce. I do the same thing with london broil or top round. Differences in my treatment include 1) I marinade after seasoning with dry--worchestershire, a little sriracha and a little teriyaki or balsamic vinegar. Leave in bag in fridge overnight. 2) Sous Vide cook in same bag (including marinade) at 130 for 7-8 hours (longer would probably be OK as well). 3) pat dry after removing from bag and prior to searing. This prevents boiling/steam on the surface and promotes quicker carmelization. I am amazed at how tender this cheap cut turns out after long slow cooking at 130 degrees. I love sous vide for cheaper cuts. Will have to try your method sometime.